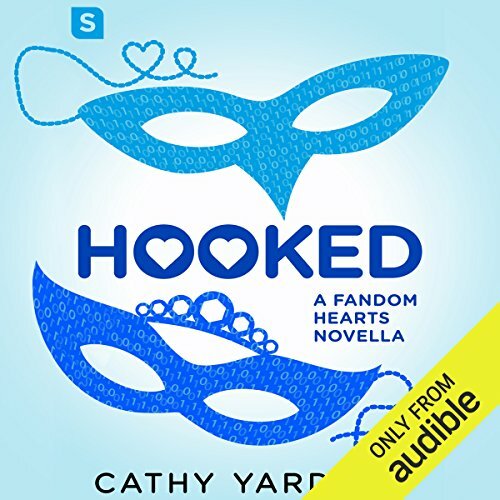 For the first time on sale, fall under the spell of Cathy Yardley's fairytale novella in her Fandom Hearts series, Hooked, in which a geeky girl with a love for the TV show Once Upon a Time finds her own real life prince charming. But when she realizes he's been keeping a secret from her - and lying about who he really is - will she be able to trust him with her heart? ©2017 Cathy Wilson (P)2017 Audible, Inc.
4.5 stars — This was a fun little novella in the Fandom Hearts world. I loved getting to see Rodney and Stacy’s little love story, and for a novella, it was extremely satisfying and gave me ups and downs, feels, laughs, and swooning. The narrators are, I believe, the same as for the first book in the series (Level Up). The male name is different (Dirk Slade for Level Up, Jay Skelton for Hooked and all subsequent audiobooks in this series), but he sounds EXACTLY the same. They both did a great job, again, although I was surprised that Rodney’s POV wasn’t all with an English accent. Only his dialogue, or specific thoughts were. I don’t actually mind that in the end, it just took me by surprise. I thought both narrators did fairly good English accents, though I’m not British, so I can’t say it was at all accurate. I still found Mr. Skelton’s narration to be a bit quieter than Ms. St. Clair’s, and so I had to turn up my volume more than usual. As for the story — seriously, super duper cute! I loved that they had so much in common, even if Stacy didn’t know it. I loved that Rodney truly was just intrigued by her initially, and only started to fall after getting to know her. I loved seeing them connect with one another, and their chemistry was definitely butterfly inducing! I loved them together, but I also loved both of these characters individually as well. My heart ached for Stacy’s loss of confidence in her own judgement. I hated seeing her family unintentionally do more harm with their protective instincts, but I loved seeing Stacy get her backbone back. I totally felt for Rodney’s situation too, and actually did understand his need for keeping his identity a secret. I loved that he’d found a place where he could be himself and just be accepted for who he truly was deep down. He was so caring and sweet, and I loved his persistence and determination when he decided he wanted to pursue a relationship…but at the same time he was very clear that if that’s not what Stacy wanted as well, then he wouldn’t continue to harass her. I’ve noticed that theme in these books — sort of female empowerment, and the wonderful men who understand boundaries and do their own part. It was great seeing the book store girls and the Mysterious Pickles peeps, even just briefly. I have a soft spot for them. So yeah. A perfect little interim novella, and I’m debating rereading the next two books by listening to their audiobook versions, b/c I really love this series.